We live in an incredibly beautiful world. Our planet is our home and I believe it is our responsibility to care for our home and all beings that we share it with. I am a proud environmentalist, humanitarian and animal lover. For me this involves ensuring that my art and business does not contribute to the exploitation of animals, people or the environment and is as waste-free as possible. I try avoid all single-use plastics in my everyday life and have implemented this in my business as well. My art is sold in reusable plastic sleeves and use minimal packaging. I hope that my tote bags are used as a replacement to plastic bags, so I had added a pocket that allows the bag to fold into a pouch to conveniently carry. Certified Organic Cotton grown without the use of herbicides or pesticides. In the future I hope to source ethically made Hemp bags, however at the moment this has not yet been possible. 10% of sales donated to , an incredible grassroots program in rural Chimaltenango providing education and nutrition. I spent over 1 year volunteering with this project and have firsthand witnessed the undoubtable impact that they are having on the lives of over 100 children. I am a passionate vegan and strive to follow an ethical lifestyle that involves using only cruelty free products. My inks used for screen printing are 100% vegan, contain no animal products and are NOT tested on animals. Additionally my inks are water based and contain no harmful chemicals. I try to source all my products sustainably and ethically, I try to reuse products that would otherwise go to waste. I make my own screens for screen printing from wood gathered from broken furniture. My prints are sold in reusable sleeves. 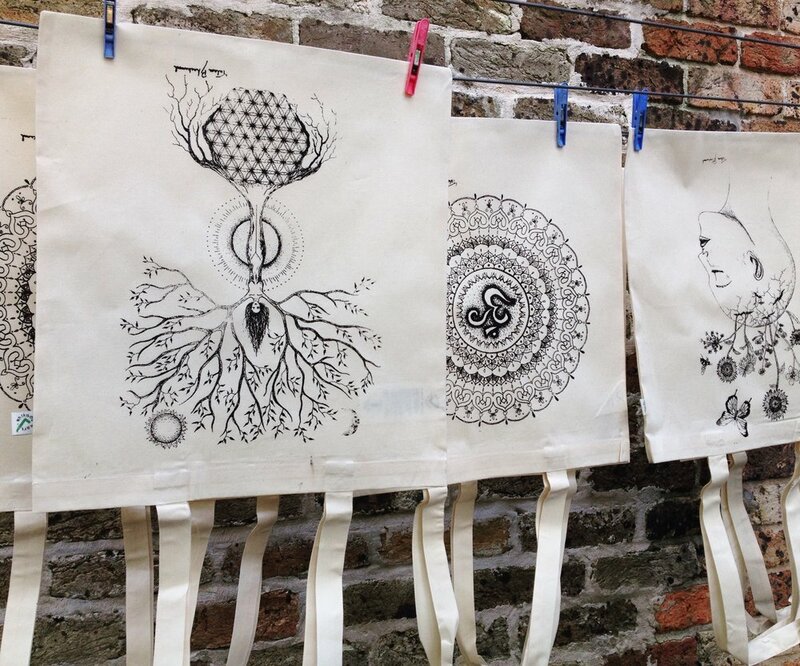 My tote bags are manufactured in accordance to the Fairtrade association standards, ensuring that all workers involved in the growing of crops and the manufacturing of the fabrics and bags are sufficiently paid and treated with respect.